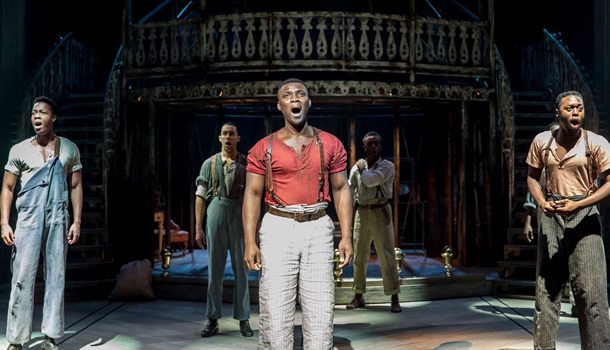 After a successful run at the Sheffield Crucible, Hammerstein musical Show Boat sails into the New London Theatre with all of the grace and gusto that the West End needs. Following the departure of the highly acclaimed War Horse, the musical has big shoes to fill in the expansive venue. Although potentially risky to place a traditional musical in a contemporary venue, particularly one that so suited the innovative War Horse, Show Boat glides in with such pizzazz and flair that you can’t imagine it being anywhere else. Telling the story of three generations aboard the glitzy Cotton Blossom, Show Boat is a wonderfully romantic musical, following the tumultuous relationships between couples across the Blossom. Daniel Evans’ revival of this classic musical gets off to a slow start, but the pace is soon picked up by Alistair David’s inspired choreography, which sees some fantastically emotionally-fuelled performances from the exceptional ensemble. Show Boat is packed full of star turns, with a wonderfully strong ensemble who deliver a vast array of genuinely tear-jerking moments. Emmanuel Kojo leading the rendition of timeless classic “Old Man River” was particularly memorable moment, as was Rebecca Trehearn’s beautiful ballad “Bill”, which she delivers with a voice so velvety that you half wish she was singing the entire score. Her role as the troubled Julie La Verne is definitely a show-stealer. Gina Beck and Chris Peluso as the slightly too sweet romantic duo Magnolia and Gaylord were pleasant enough, their voices melding well together on the bigger duets, and they definitely had the chemistry required of the roles. Comic relief was provided by Sandra Marvin as Queenie, who worked wonderfully opposite the deliciously dashing Kojo as Joe. In this particular performance, swing Georgie Ashford filled in as Ellie May Chipley and was absolutely outstanding, providing excellent comic timing with a heavily sarcastic wit and girlish voice that had the whole audience in giggles. It’s difficult to imagine this role being played by anyone else! When you do a musical set deep in the south, it is so important that the accents are spot-on. And they were, for the large part, but a slight gripe would have to be the lazy diction, which definitely became more noticeable as the show went on. Nevertheless, the energy behind the whole ensemble is enough to knock you off your feet and create a technically faultless show. It seems that there is a window for traditional musicals on the West End; Funny Girl, Sunset Boulevard and Guys and Dolls are playing across London, making this the perfect time for the marvellous musical that is Show Boat to have its turn. A heartfelt, sincere production, it’s a hugely deserved transfer that is perfectly at place, moored in the West End.